It's time to make your familiar more fearsome! 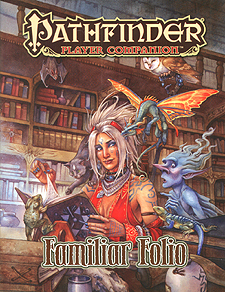 Whether you're looking to give your magical ally an archetype to transform it into a brutish battle companion or you're just scouting the menagerie of available familiars, Pathfinder Player Companion: Familiar Folio has you covered. This volume provides a bevy of new options, including new rules that allow characters of any class to gain familiars. Featuring all-new feats, items, spells, archetypes, and - of course - familiars, this Pathfinder Player Companion is the perfect accessory for spellcasters, as well as any player who fancies teaming up with a fantastic, travel-sized friend. New archetypes like the duettist bard and eldritch guardian fighter, allowing classes traditionally without familiars to gain animal allies tied to their classes abilities.